I spent a large part of my youth and young adulthood in the “good, old South,” both as an Air Force brat and as the wife of a Vietnam Vet. The South of of the KKK as well as the South represented by Sen. Mitch McConnell – the South that never hid its racism behind closed doors. In 1968 and again in ’69, my family – descendants of early No. European settlers of the colonies and of decorated Revolutionary War heroes – lived in Ft. Knox, Kentucky, Sen. McConnell’s home state. My youngest daughter was born there. I know people like Sen McConnell. They were the people who called my eldest daughter, a second grader, some of the most egregious and horrid names possible because she befriended a neighbor girl of her age who just happened to be Black. By the way, it was this girl’s family who offered my very young children and me shelter in mid-winter when a SNAFU occurred that locked us out of our military housing – an offer, might I add, that none of white neighbors extended. one of those people who yelled vile names at my daughter while saying publically, “Hey, no way am I racist.” They were and are very good at keeping their racism behind closed doors so no one saw it while using their public power and voice to continue racist policies and practices. In the deep South, the Civil War is still called the War of Northern Aggression because their political descendants, like McConnell, refuse to acknowledge the evil of their own deep seated – and often self-unacknowledged – racism. Even at his age and station, McConnell hasn’t lost the central reason for his success: an unrivaled instinct for the modern, Southern-based politics of cultural resentment. His roots are in a modest, middle-class part of South Louisville. Always the student-body president, he made up in hard work what he lacked in connections. He grew up in a time and a place suffused with Barry Goldwater’s libertarianism, George Wallace’s populist anger, and Richard Nixon’s bare-knuckle tactics. He took aim at Kentucky’s old Democratic [pre-civil rights legislation that turned so many Democrats into Republicans] hegemony and demolished it. Government wasn’t the answer; it was the enemy, because the downtown elites ran it. 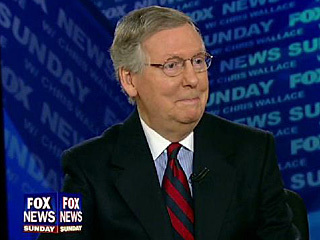 Yes, McConnell enjoys his position as the Senate Minority Leader, bringing home the lots and lots bacon to KY and his lobbyist friends. Yes, he loves the stopping this President from succeeding, but not because this President has opposing ideas. McConnell blatantly is against this President…period…because this President is black. As a result, McConnell will go to any lengths and use whatever tactics he has at his disposal, including coercion of his party’s moderates, to defeat this Presidency. His mission is to attack and destroy, regardless of the consequences to the rest of the country. Senator McConnell is the belief descendant of George Wallace’s Old South. Unfortunately, Mitch McConnell isn’t the only one from the “Old South” who hide their racism behind a plethora of State’s rights, national security, budget deficit, and other issues to the detriment of the entire country. McConnell – those of his age and ilk – really have no endemic, ideologic problem with President’s agenda, after all they voted for and passed the largest and most expensive unfunded Medicare expansion in history. What they really oppose is a Black President. Excellent article giving a human side to a very cold political reality. Racism is not dead in Kentucky or in any other state, and is as strong in the South as in the Midwest, North, and West. I grew up in Iowa over sixty years ago and watched the KKK march (they headquarter in Charles City) against immigrants, blacks, Jews, etc. with one of their main sites being located in Boone, outside of Ames. As a child I watched burning crosses the fire department would not put out, and as a college student received KKK political literature attacking Kennedy, LBJ and other people. I was there when the KKK marched outside of Pottsboro, heard their screams in Ames a decade ago, and traveling to Kentucky saw them line the roads with signs for Palin. They are as real and dangerous as the Sovereign Citizen–and McConnell solicits their votes.